It’s hard to resist the almost stuffed animal look of the Bolognese, with their dark eyes, black button nose, drop ears and plush soft white coat. These dogs seem to have the personality that might just be perfect: calm, playful and devoted to their owners. But, they are still a very rare breed, and as such are difficult to find and somewhat expensive. What makes people so enamored by them? The Bolo as they are affectionately called by fanciers is a playful, easy going breed who is totally devoted to his people and willing to please. For anyone looking for quiet, low energy dogs that almost never shed, and that are easy to train, then this is the breed for you. But, be patient, as you may have to wait awhile to find a puppy or adult from a breeder or rescue organization that meets your needs. 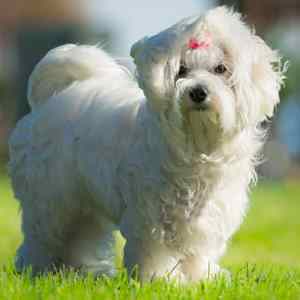 The Bolo belongs to the Bichon family group of dogs, which includes the Bichon Frise, Coton de Tulear, Havanese, Löwchen and Maltese. Even though all of these dogs have some similarities, they are all identified as distinct breeds. The Bolognese, pronounced "bowl-oh-knees," is pure white with a thick cottony coat which requires some daily grooming. They have a somewhat square body, with their length equal to their height. Their coat is fluffy and dense that does not shed, making them ideal for allergy sufferers. 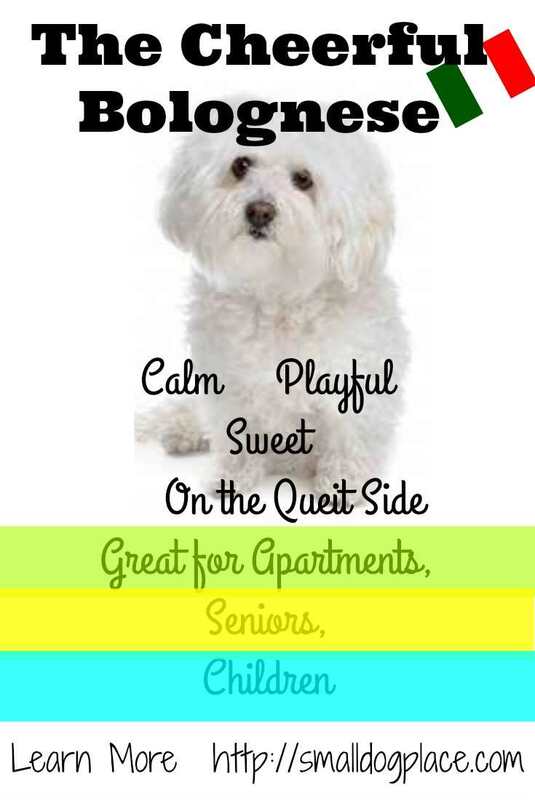 They are also calm and quiet making them a great choice for apartment dwellers and seniors. They are listed in the AKC Foundation Stock Services but are not eligible for AKC registration, though they have been designated in the toy group. 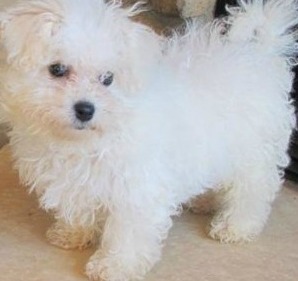 Other Names Used Bichon Bolognese. The history of this breed dates back to the 11th to 12 century Italy where its development began. 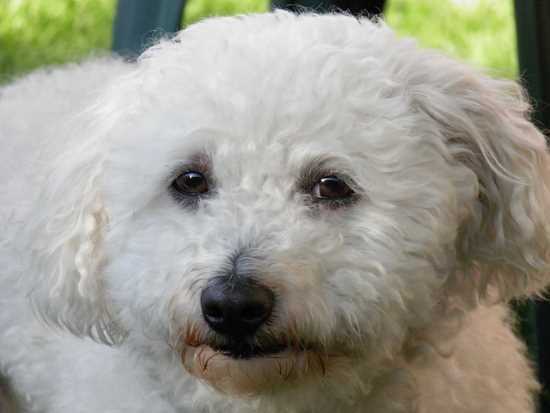 They belong to the Bichon group of dogs that originated from small white dogs called “Melitensis,” that were found in most Mediterranean countries. 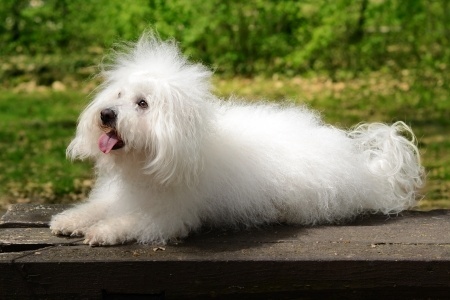 This group of dogs consists of the Bolognese, the Maltese, the Havanese, the Bichon Frise, the Coton de Tulear and the Lowchen. During the Renaissance, they became a favorite with nobility, often being presented as gifts. At the time, the Italian Nobility was known for giving puppies as gifts to other nobility and these little white puppies were considered to be symbols of wealth. They became popular in Spain and Belgium and throughout Europe as a result of this gift giving practice and began appearing in paintings by artists such as Francisco Goya and Tiziano Vecelli. They were also found in writings and mentioned by Aristotle. Over time and with less and less emphasis on monarchies, the Bolognese nearly became extinct. Several European breeders loved these dogs, and tried to promote their reestablishment into modern day popularity. One man in particular, Gianfranco Giannelli, from Italy is identified as having revived the interest in these dogs. It wasn’t until 1990 that the breed was brought into England by Liz Stannard and was first shown that year in the Imported Register classes. In 2001, the breed was able to be shown in their own class and then in 2002, they were shown at Crufts, the prestigious dog show in the UK. In the US, these dogs still remain rare. They were first introduced and recorded into the AKC Foundation Stock Services in 1999 and remain there to this day. AS of 2015, they have not obtained the necessary prescribed milestones for them to progress to the AKC Miscellaneous Class in the Toy or Non-Sporting Group. 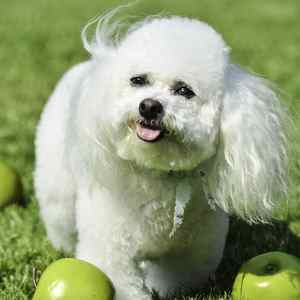 Though this breed is descended from Bichon-type dogs, they are less energetic and quieter than their modern day cousins. They have been bred for centuries to be nothing but companion dogs, and they do this job very well. They do not bark much but will alert their owners if they perceive danger is near making them a good watch dog. Around strangers, they are reserved, but not aggressive. If socialized at a young age, they warm to strangers quickly and become quite friendly. They are cheerful, playful, and loving and known for being highly bonded to their human owners. They prefer to be close to their people and will follow from room to room. They do not do well if left alone for long periods of time and are prone to separation anxiety if forced to be separated from their people. Their docile, easy going nature and their strong devotion to their owners make them very sought after dog. Those people who are looking for a peaceful, happy, quiet dog may have found just what they want in a Bolognese. The Bolognese is intelligent and eager to please, so training is usually easy with this breed. Obedience training occurs fastest when started early; training should begin the moment you introduce your new puppy to your home. Most of their exercise needs can be met through indoor activity, but they do enjoy a daily walk and will happily romp around a fenced in yard. They shed very little, so they are considered a good breed for allergy suffers. Their small size, quiet and inactive nature makes them ideal apartment dwellers. They are also ideally suited for seniors and make great travelers for those people who are on the go. To keep the true nature of the Bolo “look,” the coat is not trimmed or shaved except for sanitary purposes and to keep hairs away from the eyes. Regular grooming is needed to keep this look because the coat is thick and will mat if not brushed and combed at least several times a week. If the long hair is just too much, regular visits to the groomers are in order. A cute shorter version of the traditional Bolognese is to trim it to about one to two inches all over the body, except the head. But, as you can see in the picture above, some just prefer to clip short. Sometimes this is the only way to remove very heavy mats and make the dog more comfortable. Some people prefer to use a metal comb such as a greyhound comb instead of a brush to keeps mats down. Whether you choose to brush or comb the coat, you should do it at least twice a week. Spraying or misting the coat lightly with a conditioner or plain water will help control the coat and prevent breakage. There is no agreement about how often a dog should be bathed, but the best rule of thumb is when the dog is dirty. Otherwise, the dog is usually fine if he is bathed about once a month. 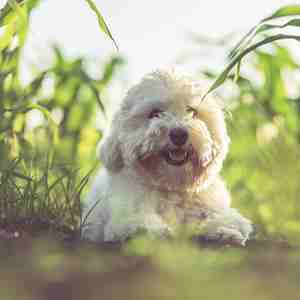 White dogs may need more frequent bathing, but even a romp in the yard or roll in a pile of leaves may not be an occasion for a bath. A quick brush through to remove leaves or other yard debris that the dog’s coat picks up may be all that is necessary to keep the dog looking clean. A good whitening shampoo is effective on this breed and to get the face super clean, use a good puppy or tearless shampoo. 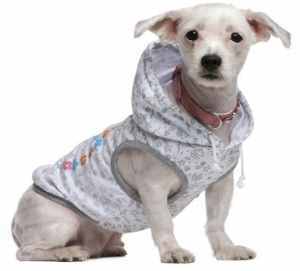 White dogs are also prone to tear stains, but not all dogs have them. Tear stains are caused by a variety of things, and there are ways to deal with them. To keep those pearly whites looking great, a daily or weekly tooth brushing is in order. Nails should be clipped about every 2 to 3 weeks. Clip puppies’ nails more frequently because they tend to grow fast. Ears should be cleaned out periodically with a good ear cleaner and cotton ball. Hair grows inside of the ear and should be removed periodically. To clean out their ears, use an ear powder to coat the ear hair and then remove the ear hairs with your fingertips. You may also use a pair of tweezers or hemostat. This is a healthy breed and responsible breeders are trying to keep it that way through health screenings, DNA testing and other health tests. These same issues have also been identified in many small breed dogs. Other problems, common to most dogs include allergies that cause itchy skin and ear infections due to hair in the ear canal coupled with their low hanging ears. Eye problems can also be an issue such as progressive retinal atrophy (PRA) and cataracts. Aristotle referred to the Bolognese as "the little white dog of antiquity" as long ago as 384 BC!